When Admiral Horatio Nelson routed the combined French and Spanish Fleet off Cape Trafalgar he won the single most decisive and far-reaching battle in naval history. Though not a single British ship was lost, Britain's most famous naval figure died in the battle. On 21 October 1805, under command of Admiral Horatio Nelson, 27 ships of the Royal Navy clashed with the combined Franco-Spanish force of 33 fighting ships off Cape Trafalgar on the Spanish coast. It was the most famous battle in naval history. As the French and Spanish ships turned back towards Cadiz in a five-mile-long irregular line, Nelson mounted a daring attack. Commanding from his flagship Victory, he divided his fleet into two divisions, each in a single column on a course at right angles to his adversary, and drove directly into the centre of the long opposing line, cutting it in two. In a five hour battle 18 of the Franco-Spanish ships were taken; the remaining fled, only 11 reaching Cadiz. No British ships were lost, but Nelson was mortally wounded by a musket shot as his flagship Victory closed in furious combat with the French ship Redoubtable. Robert Taylor's magnificent painting shows Victory breaking through the enemy line at 1.00pm. A broadside has crippled Admiral Villeneuve's French flagship Bucentaure, seen off Victory's port side, while Nelsons gunners fire a second broadside into the Santisima Trinidad. Just astern, the Temeraire manoeuvres to trap the Redoubtable between herself and Victory, and thus seal her fate. As Victory and Redoubtable crashed together, their yards locked, French marines in the rigging threw grenades and fired down on Victory's decks. Admiral Nelson took a musket ball through his shoulder, smashing his spine. Taken below, Nelson survived long enough to be told by Captain Hardy the battle was won. "Thank God I have done my duty" were his last words. Admiral Horatio, the most famous naval commander in history, died at 4.30pm that October day hundred years ago. Nelson had thwarted Napoleon's plans to invade Britain, and gave the British Navy supremacy of the high seas that remained unchallenged for one hundred years. 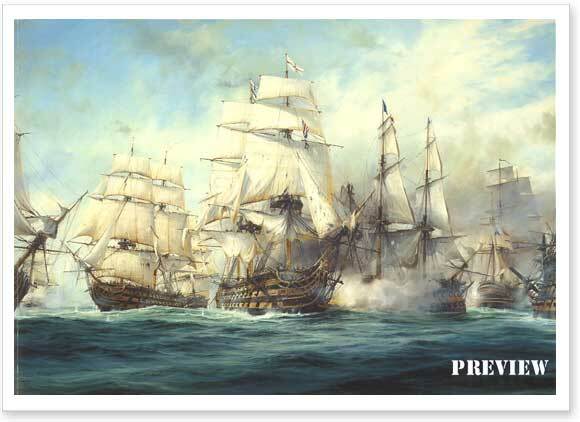 Robert Taylor's painting is a contemporary master­piece, regarded by many to be the finest, and most accurate account of this famous sea battle painted in modern times. IN THE FOOTSTEPS OF HORATIO NELSON -A truly unrivalled opportunity for collectors to acquire a rare artefact of the greatest historic significance. A single section of PURE ENGLISH OAK, removed during the restoration of HMS Victory, has been beautifully encased within a conservation double matte, to give collectors a unique chance of acquiring part of the Royal Navy's most famous warship, over whose timbers history was made. To guarantee the authenticity of these rare historical items, each is issued with an official Certificate of Provenance endorsed by the Royal Navy Museum, Portsmouth. This special edition comes with free framing so remember to select the "Print Only" option when purchasing!